Many surfers in the Great Lakes are unsung heroes who have saved many lives because they have spotted swimmers in trouble while catching waves. Surfers have a strong knowledge of the dangers the water presents, and they are often in a good position to spot and make a rescue. Surf Lifesaving has deep roots in the Midwest. Tom Blake was a pioneer waterman from Wisconsin, and has been the lead designer for surfing and lifeguard gear. Blake invented the surfboard fin, hollow paddle board and the lifeguard buoy. Following in the tradition of connecting surfing to lifesaving, a group of Great Lake surfers have formed an organization called the Third Coast Ocean Force designed to educate the public on the dangers of water currents generated from waves. Eight year Ocean lifeguard Joe Matulis was one of the speakers at the Third Coast Ocean Force Rip Currents conference and workshop held in St. Joseph, Michigan on June 5, 2011. Matulis was asked to share his professional knowledge about spotting potential rescues. There are many earlier signs that can be seen from shore or from the water. “When I am at the beach I look for swimmers that are not in swim attire, swimmers facing the beach and swimmers that are in large groups.” he said. There are many differences between the Pacific Ocean and Lake Michigan. The beach goers in the Midwest usually don’t experience surf because waves are uncommon in the crowded season. However, a few times every summer, wind generates waves and rip currents are formed on the crowded Midwest beaches. When these unusually large waves occur, the majority of the beach goers are not aware of the dangers that are created. Today, very few Great Lakes beaches have lifeguards on duty. Great Lakes surfers, however, can make a difference for victims of rip currents. Surfers have the ability to navigate through surf and when there are waves in the lakes there are plenty of surfers. It only makes sense that surfers need to be trained to identify possible drowning victims. Bob Pratt, a former lifeguard and a Great Lakes surfer explained how rip currents can flow out along the concrete piers in Lake Michigan. Compounding the problem of rip currents in the Great Lakes is the fact that these currents are more difficult to spot in the Great Lakes than the ocean. The reason rips are harder to see in the Great Lakes is because rip currents only form when there is surf. The surf is normally only big when the weather is stormy and cloudy. Stormy weather makes it harder to see the differences of water color because of the overcast skies. The waves in the lakes also have a much shorter interval period and therefore there are twice as many waves that swimmers have to contend with. The waves on the Great Lakes may break every seven seconds compared to a south swell in Southern California that would have about a twenty second wave interval. After the classroom training session the class went to the beach to practice rescue techniques. In addition to Great Lakes surfers, area water rescue teams also attended the training session to learn about using a surfboard to assist a drowning victim. 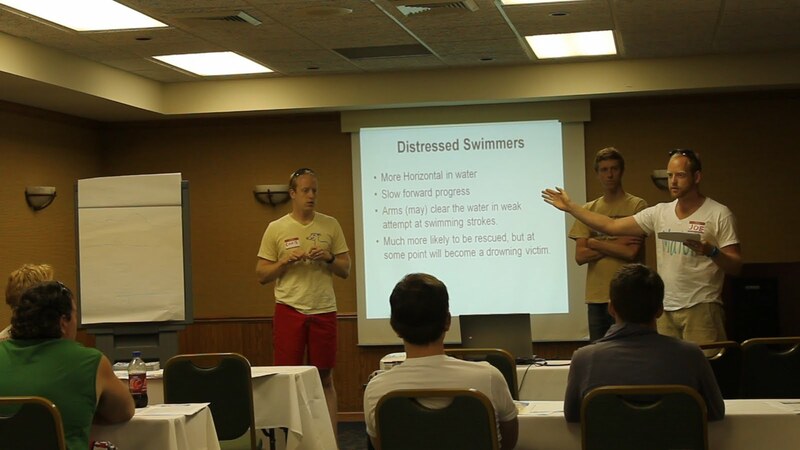 The class practiced these techniques and discussed how to triangulate a submerged swimmer, how to handle a possible spinal cord injury victim and where to enter the water in different possible swell situations. This is an important step forward for protecting swimmers in the Great Lakes.